To express yourself musically, you need to form a physical bond with your instrument. In the case of the AvantGrand series, it starts with the keys. Real wooden keys with a comfortable touch, thanks to Ivorite® keytops that look and feel just like natural ivory. Then comes the all-important key action, which the AvantGrand series has inherited from Yamaha’s esteemed concert grand pianos. Beneath your fingers you sense the same precise weight and responsiveness, the same scope for expression. To capture every nuance of your performance, Yamaha employs a non-contact optical sensor system that doesn’t affect the feel or performance of the action in any way. 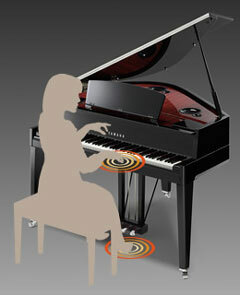 Under each key is a continuous optical sensor that captures the speed and depth at which that key is depressed. An additional optical sensor affixed to each hammer shank measures the timing and strength of the hammer hitting the virtual "strings". This information is instantly translated into a beautifully authentic sound reproduction. The more you play, the more you find yourself becoming one with the piano. When it comes to judging piano tone, much depends on personal taste. To help you achieve the tonal palette you desire, Yamaha offers the choice of two world-class grand pianos in one—each with its own unique character to convey the emotion you want to express through a piece of music. At the touch of a button on the new AvantGrand N3X, you can opt for authentic sounds sampled either from a Yamaha CFX concert grand or from a Bösendorfer Imperial. As Yamaha’s flagship grand piano, the majestic CFX boasts a wide palette of tonal colors, from sparkling high notes to powerful bass tones. 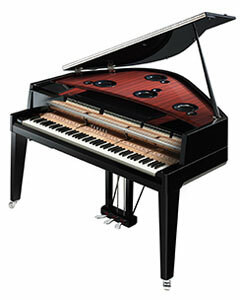 The legendary Bösendorfer, meanwhile, is renowned for its warm and subtle Vienna tone. Either way, the lifelike sounds of the AvantGrand N3X allow you to explore the outer reaches of your expressive imagination. In a grand piano, strings and sounds resonate throughout the entire body of the instrument producing a rich reverberation that envelops the listener in sound. Not only are the strings you are playing vibrating, but other strings ring as a reaction to ones you play. This is one reason the piano sound is so complex and rich. 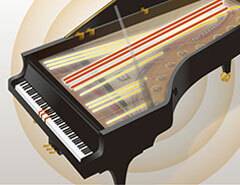 This phenomena is reproduced perfectly in the AvantGrand N3X through Virtual Resonance Modeling (VRM) which calculates the various states of the strings for each of the 88 notes on the keyboard from one instant to the next. 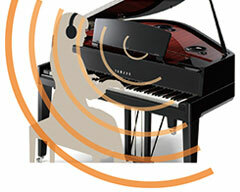 As a result, the N3X reflects the limitless number of factors inherent in playing an acoustic piano such as which keys are pressed, the strength with which the keys are played and pedal timing.